Pickle juice is one of those magic elixirs that helps your body and your mind recuperate from the everyday in surprising ways. It's no surprise that when we talked about the benefits of drinking pickle juice, people listened. From easing muscle cramps, from leg cramps to PMS, to extending longevity, pickle brine just so happens to be one of the most inexpensive remedies around. And it just got even easier to get your regular intake with this gallon of pickle juice on Amazon. Gone are the days of buying huge jars of pickles just to drink the dill juice when the pickles are finished. Well, those days certainly aren't gone because we still need to get our dill pickle and pickleback shot fixes, but now you can just drink pickle juice whenever you want! 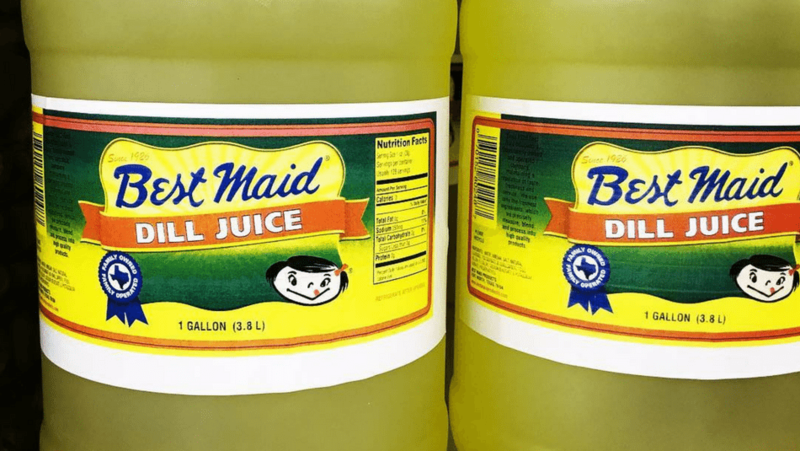 Pour up a glass with the Best Maid Dill Juice for only $25.95. Born in Mansfield, Texas in 1926, Best Maid began as a mayonnaise company from the kitchen of Mildred Dalton, whose husband Jessie Otis Dalton operated a small single room grocery store in Fort Worth, outside of Dallas for those unfamiliar with the Lone Star State. Per their origin story, Mildred used so many egg whites for the meringues she sent to the grocery store, she had no idea what to do with all the yolks. So like any good Texan looking to make an extra buck, she got crafty and began whipping up some of the best mayonnaise Fort Worth had seen. That delicious mayonnaise would soon become the backbone of all Best Maid products. To complete the perfect sandwich trifecta, the Daltons began making pickle relish which in turn led to a huge pickle patch in their yard. And the rest, you could say, was history because those Best Maid pickles are so crisp and delicious. Today, Best Maid makes pickles, jalapeños, relish, and dressings. Oh, and they also sell a gallon of dill pickle juice because if you have leftover brine for the juice, you might as well sell it, y'all! What would you use it for besides drinking? Turn it into a snow cone or a popsicle by pouring right into popsicle molds. Or just use it as a substitute for Gatorade like the rest of us pickle lovers in the know! This post was originally published in July 2017.